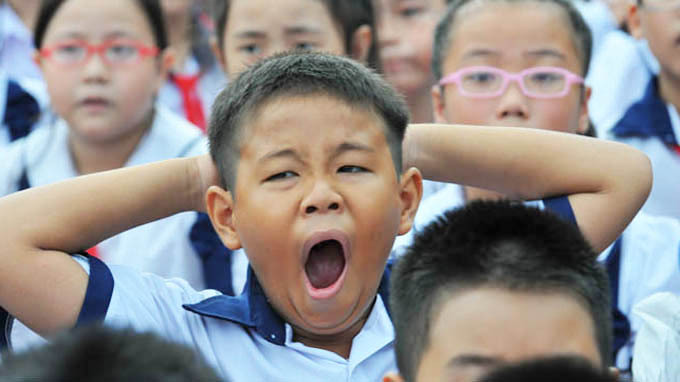 A Ho Chi Minh City elementary school student is seen yawning in this file photo. Vietnamese parents are complaining their children suffer from lack of sleep because of early school hours. Vietnamese parents are protesting that early school hours have deprived their children of sleep, demanding that schools begin an hour later than normal. Local school students currently begin their classes between 6:45 and 7:00, waking at 5:30 or 6:00, even when they must stay up as late as 23:00 struggling with an enormous amount of homework every day. One mother, Ngoan Tu, complained to Tuoi Tre that she must wake her child at 6:00 every morning as their school closes its gate at 7:00 sharp. They start off at 6:45 every day in a hurry; if they’re late, her child will be left outside the school gate, she said. People sleep most soundly between 5:00 and 6:00 so it is an ordeal for children to wake up at that time, Tu pointed out. Another parent said that his grade-six daughter has to rise at 5:30 to prepare for her school day. Returning home at 17:30, the girl sits down for her homework two hours later and will not turn in until 22:00 or even 23:00 if she has a lot of homework, Nguyen Chung, a father, said. Many parents suggested that classes should begin a little later, at 7:30 or 8:00, depending on each neighborhood. “Why don’t they start at 8:00 so that our children can sleep for a bit longer and get up at 6:30?” Hong Phuong, a mother, wondered. A father, Vo Minh Doan, whose two elementary school children must get out of bed at 6:00 and scramble to get ready for school each morning, said that a starting time of 7:30 or 8:00 would enable his kids to be more relaxed and suffer less from lack of sleep. “Why do we force them to start so early?” Doan asked. Children should be allowed to sleep more so they can study better at school, Phu Cuong, a parent, said. A doctor has told Tuoi Tre that school hours in Vietnam are set in an “unscientific” manner and have thus caused a lot of stress for students. Luong Le Hoang, from the Ho Chi Minh City-based Center for the Treatment of High-Pressure Oxygen, said that lack of sleep can harm one’s intelligence, hinder the development of their height, and prevent them from effective learning at school. “It would be better to be illiterate than to harm our health this way,” Hoang said.